On Thursday I made a verbal submission to this inquiry. Housing Voice is the "campaign alliance established to champion the need for more affordable homes to buy or rent". The inquiry is gathering evidence across the country on ways to combat the "affordable housing crisis". Lord Larry Whitty is chairing the inquiry (seen in centre of picture with panel members Steve Hilditch and Michael Ward). Heidi Alexander MP for Lewisham East and on the CLG Select Committee (left) spoke as did UNISON General Secretary Dave Prentis. There were 18 speakers listed! "Housing Professionals Voices", "Voices of those at the sharp end"; "Labour Voices", "Local and Regional elected" and "Other voices". There were politicians from across the political divide. Residents and a wide range of other people with interest in affordable housing took part and contributed. There was disagreement about the solution but no-one denied that we have an appalling housing shortage and that homes are currently unaffordable especially in London. Access to land with permission to build, planning and finance seems to be major barriers. Solutions offered included housing co-operatives, deregulation (House Builders Federation) and greater regulation (of private sector including rent controls: not I think supported by the HBF), funding from pension funds. I think the role of public funding is absolute key and while there is a lot that can be done to improve supply and affordability at the margin, without a significant funding in state funding we will not resolve the crisis. We will only get the funding when we can raise the political interest in housing to match that of education and health. Labour London Assemby member Valerie Shawcross was the last speaker. In the Q&A some Housing Associations got a bit of a pasting from the politicians over their variable management standards, being so fragmented, inefficient, arrogant and unaccountable. I'll post my submission later. It just goes to show that you just can't keep a bad man down! Poor old Bradford West. They will soon learn - as did the people of Tower Hamlets. First posted here November 2007. Hat-tip Col Roi. 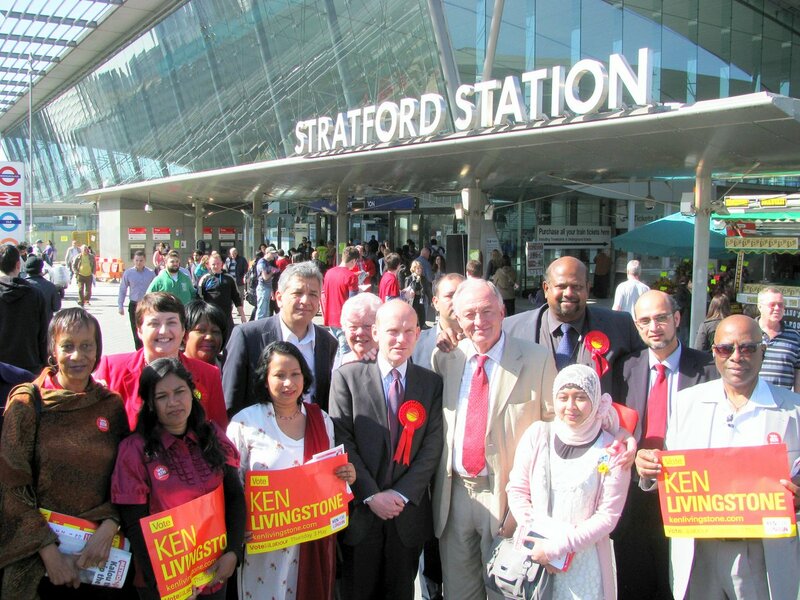 Guest Post from Tahmina Rahman, Forest Gate North Labour Party Secretary (3rd from right in photo) “A really positive response yesterday lunchtime from the local Newham residents and visitors at Stratford station. Labour Mayor Candidate Ken Livingstone was joined by Val Shawcross who is the deputy Mayoral candidate and local East London Assembly candidate, John Biggs. Together with other local Labour Party activists we handed out leaflets and talked to people about “Fare Deal” and how the average Londoner could save a £1000 over 4 years". Now only 3 Sundays to go before the London Marathon 2012. I am resigned to do it but am wondering why on earth am I doing it? For the second time??? The painful after effects of the long training runs remind me exactly why I swore I would never, ever, never run a marathon again after my experience in 2002. I should have known better! I've got fitter, lost a little bit of weight and I'm raising funds for a very good cause but frankly I think I will stick to a 30 minute jog around Wanstead flats and putting money into charity buckets at railway stations in the future. Run of the week was on Saturday morning while I was in the City of York for the UNISON International Seminar. In the morning I went around the medieval City walls which are almost still complete. 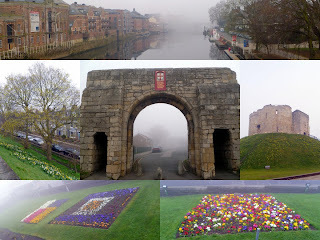 It was a foggy and the picture collage above does not do justice to York which is a breathtakingly beautiful and historic City. This is a fantastic run with lots of ups and down stairs at the numerous City gates. When I was a child the Gray Clan use to come at Easter to York for camping and caravan holidays. So visits always brings back good memories. The one deeply unpleasant but very important memory I have of York was when visiting the 900 year old Clifford Tower, the old keep of York Castle, (see in collage on right) and slowly realising that this was the site in 1190 of a shameful "pogrom". 150 Jews (men, women and children) living in York at that time, were attacked by a mob and had tried to take refuge in the Royal Castle but were forced to commit mass suicide inside to avoid being tortured and murdered by the mob. As a history obsessed teenager, very proud of his Country's history and heritage, the realisation of what had occurred on this very same spot was a complete shock and a never forgotten lesson. A lesson sadly repeated on occasions in future years but never with the same first time chest thumping appalled impact. I am running the London Marathon for a charity set up to prevent young people becoming homeless and helping them if they do. Check out "Alone in London". Click here to sponsor me on the Justgiving website. 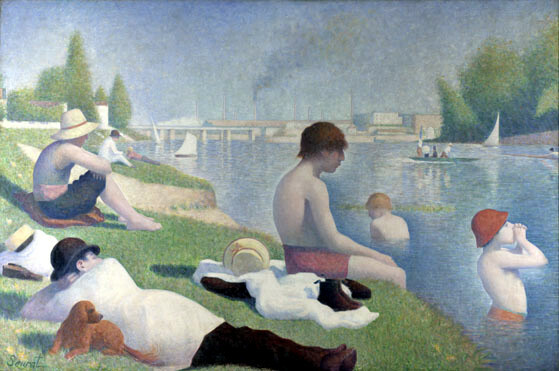 This is simply brilliant "French Impressionism isn’t the first thought that comes to mind when it comes to the Olympic Games, but that’s exactly what sparked the creation of a photograph by Olympic Delivery Authority artist-in-residence Neville Gabie. 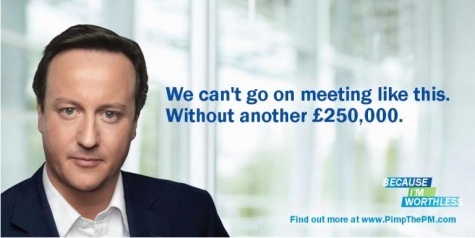 We can't go on meeting like this... without another £250k. Hat tip Alasdair Ross "Maybe instead of campaigning to save the NHS - we should have just has a whip round and bunged Dave 250 grand?" The 3rd presentation on Saturday at the UNISON International Seminar 2012 was by trainer Dave Hampson (left) chaired by Paul Gover NEC. Dave has worked for a number of BOND-affiliated aid agencies such as Christian Aid, Oxfam and VSO as an evaluator and human rights advocate. He is also a security risk consultant and advises organisations who work in the developing world on the risk of kidnapping! This was an icebreaker session and light hearted look “at what power means to individuals and...what that means in respect of world events”. I won’t reveal what happened since it will spoil it if you ever attend a similar training. It was a relatively “physical” activity and aimed I think at NGO workers rather than trade unionists but it did make me think about the advantages that I have had in life as a white, British born, able bodied, university educated male. Dave also reminded us of this saying by Margaret Mead "Never doubt that a small group of thoughtful, committed citizens can change the world. Indeed, it is the only thing that ever has". At the end International Officer Polly Jones (right of picture), briefed us on how to apply to UNISON for support from the UNISON Development Fund (UIDF). This presentation to the UNISON International Seminar 2012 was by Mariela Kohan (left), Director of “Justice for Columbia” and Chaired by Josie Bird, NEC member. Columbia is still the most dangerous place in the world to be a trade unionist. 70% of all such murders take place in Columbia. The new government claims that right wing militias have been disarmed. However, trade unionists and human rights activists are still assassinated and others threatened. While many are imprisoned without trial on “preventative custody” orders accused of “rebellion”. JFC was set up by the TUC in 2002. All major unions support it and 80 MPs/Peers are “Parliamentary Friends of Columbia”. JFC has recently launched its “Peace Campaign”. What many people do not realise is that the chief problem in Columbia is the bitter 50 year old “civil war” between the Government and the FARC, not “drugs”. JFC hope that the campaign will help bring about a “Northern Ireland” style peace process in Columbia. The seminar is taking place in York. It actually started Friday evening which I missed due to work commitments. This morning the first presentation was by local Labour MP Hugh Bayley (former junior minister) on "International Development and the UK Parliament". Isobel McVicar, Community NEC and member of the UNISON international Committee chaired. Hugh reminded everyone that York itself use to be an Italian and Danish Colony. While he in a former life was a NALGO district and national officer and can remember the "incredibility" he use to face (I suspect he is being polite) when he first tried to get NALGO to take international trade union solidiarity seriously, especially with regard to the staff pension fund and a boycott of investments in Apartite South Africa. Nowadays it is also widely accepted that the purpose of international aid is to eliminate poverty not promote trade. This is a victory for progressives. He remembers the howls of protest by the Tories in the Commons when he first suggested this. It is also a victory that the Tories have agreed to honour the Labour Commitment to 0.7% of GNP to international aid (even if they have cut this with a £1.2 billion delay). You can be cynical that they are just pretending not to be "the nasty party" anymore but there has been a sea change in views. The same with Gay rights. Hugh sees himself and the Labour Party as very much the "political wing of the wider Labour movement". Which may I suppose be the reason why he was sacked as Pension minster by Tony Blair! 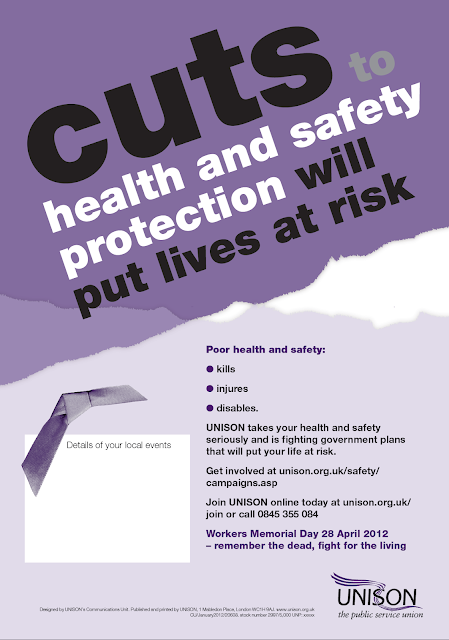 Only 5 weeks to go before this years Workers Memorial Day. Since WMD is on a Saturday this time UNISON Health and Safety Committee and UNISON offices around the country will be holding a minutes silence at noon on Thursday 26 April. I will be hoping to attend one of the events in London on the Saturday. These message have been sent out to the 130,000 UNISON members who live in London about the forthcoming GLA elections. By post, phone, email and text. Ken Livingstone has published six pledges to address the increasing cost of living in London. These are: cut fares by 7%, saving the average Londoner £1,000 over four years; reverse Boris Johnson's police cuts and restore local sergeants to Safer Neighbourhood Teams; help reduce rents and provide more secure tenancies through a London non-profit lettings agency; tackle heating bills, help households save over £150 a year; restore the London EMA, up to £30 a week to help young people stay in education; support for childcare with grants and interest-free loans, and campaign against Tory cuts to childcare tax credits. All are costed and affordable within existing budgets. Make sure you have YOUR say in London's future on Thursday 3 May when Londoner's elect the next London Mayor and the Greater London Assembly. London members have a chance to make a difference. Your vote WILL count. Register to vote or for a Postal Vote at http://www.aboutmyvote.co.uk/. On Thursday I attended this national UNISON seminar at our headquarters in Euston. Jane Carolan, NEC, Chair of Service Group Liaison welcomed us saying that the traditional response by the union to serious disputes with our employers had been industrial conflict, that option will always remain but we also need to consider other options. We had a presentation on the "Economic Overview" by Nicola Smith , Head of Economic and Social Affairs at the TUC. After a Q&A there were workshops on "Outsourcing and procurement"; "Attacks on terms and conditions"; "Negotiating with the private and voluntary sector" and "Bargaining". Then there was a presentation on UNISON Pay Strategy by our General Secretary Dave Prentis and Assistant General Secretary Karen Jennings. This was followed by a reception in the Atrium with speaker Anna Bird (Fawcett Society - see picture). On Friday morning Alistair Hatchett, Head of Pay and HR services from the IDS gave an entertaining account of how the Tories and the Tax Evaders Alliance deliberately distort and mislead on public sector pay. After the last workshop, Mike Kirby, Regional Secretary Scotland spoke on "making the best of the Coalition Government, a perspective from devolved nations". I am pleased that UNISON is taking the education and development of its activists seriously. Not just the nuts and bolts of bargaining and negotiating but the wider economic, social and economic framework. "For those practitioners with cases due to be heard at London (East) Tribunal in the next couple of weeks, be aware you may experience difficulties. The tribunal is sending out letters postponing hearings on the basis that it has "reached the full extent of the budget allocation for this financial year and, as a result, there is no remaining judicial resource available to hear your case." It would seem that all cases listed for a hearing before the end of the financial year (4 April) will have to be cancelled since the Tribunal has ran out of money. Many people might have waited months if not years for these hearings. Who knows when they will be heard again? Once again, it shows that you cannot reply on the law to protect you at work. There is only the unions. The UNISON Health Service Group Executive (SGE) agreed yesterday afternoon by an overwhelming majority to consult members by secret ballot on the final package. This will be on the basis that the proposed agreement is the best that can be achieved by negotiations. I am a member of the Community SGE (we also have members in the NHS). We met as well and agreed this position. Both SGE's are made up of elected Unison lay representatives. I think the ballot will go ahead next month. Hopefully a decision will be made on the Local Government Pension Scheme sometime in the near future. hours. During which I did intermittent interval (or fartlek) training. wobble board) but I still have a "niggle" in my left knee. The training must have had some effect since people I meet ask if I have been on holiday lately? Since I apparently look "tanned and healthy". I tell them that I am training for a marathon and actually feel knackered and in pain for most of the time. On my second circuit I ran past this "Warning Cattle" road sign Woodford Road. It is just a little bit out of date. When I first moved her in 1988 there use to be cattle roaming the flats since it was "common land". They also use to turn up in the front garden eating plants and hedges. Occasionally you had to rescue them from the local kids who would chase them down the street. It was amazing that in the midst of a great city you would see herds of cattle wondering around regardless of traffic. Sadly BSE and "foot and mouth" disease put an end to this. There are "plans" to reintroduce cattle (and sheep) which I hope one day will come to fruition. Yesterday evening the new Labour Party General Secretary, Iain McNicol paid a visit to Newham. He had a briefing on the campaign plans and went out with a door knocking team in East Ham. 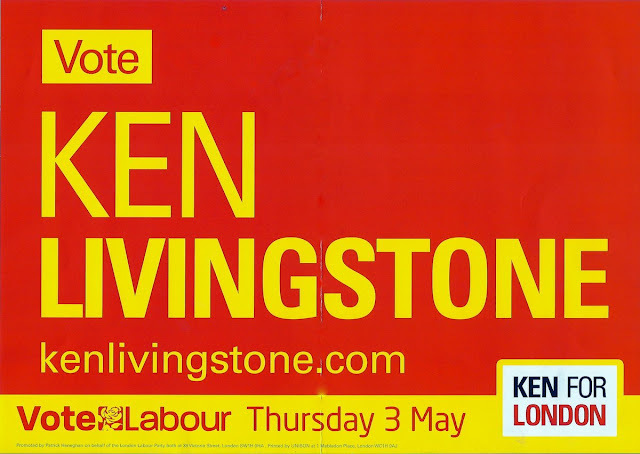 While in total there were 73 activists out last night knocking doors and telecanvassing for Ken Livingstone and Labour in the GLA elections. This picture is of some of the canvassers with the Labour candidate for the City and East London seat, John Biggs. Picture of Iain with activists. 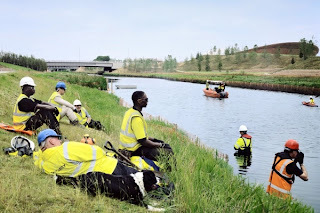 Newham: the Entrepreneurial future of London? 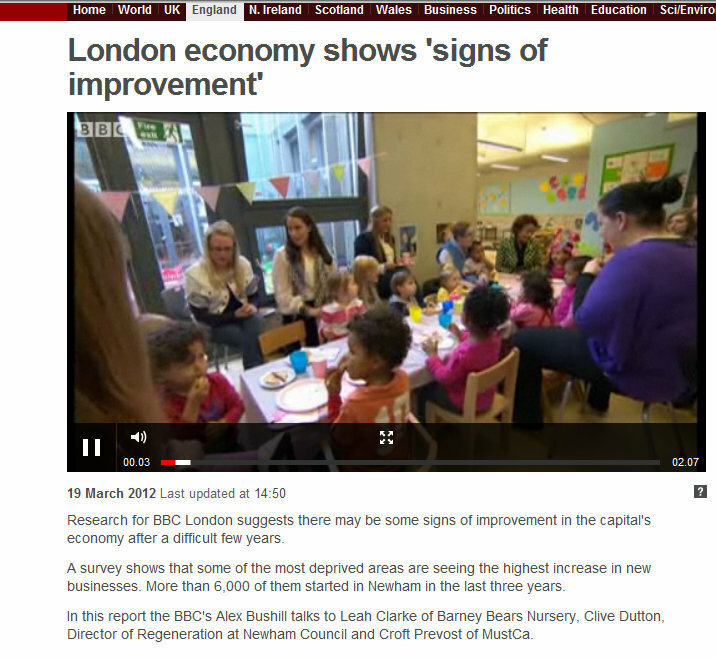 I saw this BBC news report yesterday morning on Newham being the home of the most business start ups in London. "Many boroughs saw rocketing numbers of start-up businesses, particularly in the East End. In Barking and Dagenham, between 2010 and 2012, some 7,685 new businesses began - increasing the total number by 38.6%. over the same period, to 14,672. Not only is Newham home to the Olympic Park, but it has seen a massive regeneration project around the new Westfield Shopping centre. One Newham entrepreneur is Faith Johnson. She founded Caramel Rock, a fashion company which also trains people in dressmaking and now employs five. Ms Johnson said: "It is 150% a great area to do business in. "The community is very welcoming - it's like a family." She continued: "Being the main Olympic borough makes such a difference - it brings so many people here who wouldn't otherwise come. "With so much investment in the area it's much more profitable. "I don't think that will come to an end after the Olympics." A Newham Council spokeswoman said: "An increase in new businesses is good news for Newham and demonstrates the entrepreneurial nature and resilience of our residents. 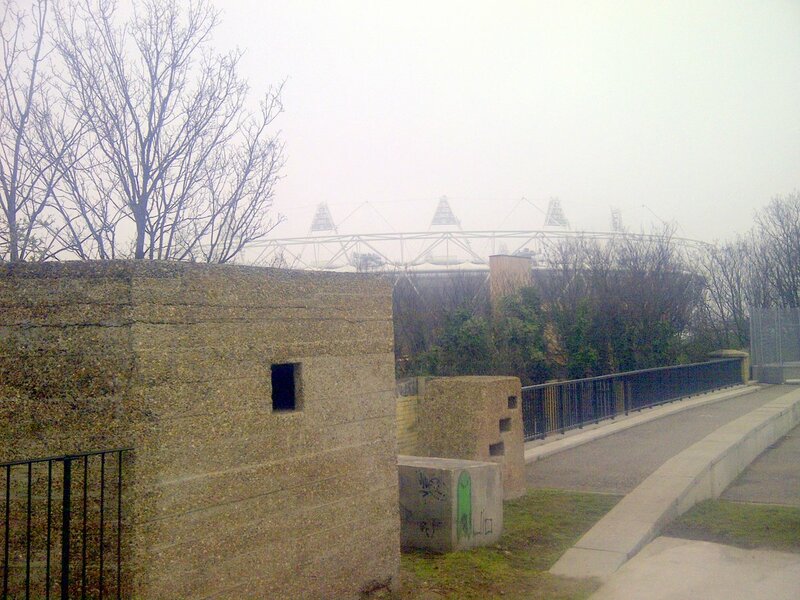 "Newham is home to some of the largest and most spectacular development sites in Europe. "More businesses will help contribute to this economic regeneration and will ultimately create more jobs for our residents." The Greater London Assembly and Mayor campaign (Purdah) 2012 officially starts to day! 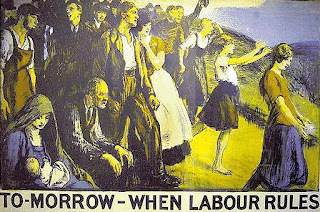 London members should have got this poster from the Party. Put it in your window! before and is a fantastic location. Picture is of the overspill crowd standing outside the first entrance which I have used google Picasa software to make more atmospheric and moody (to me anyway). I had a UNISON regional service group meeting earlier so I missed Eddie Izzard and the other speakers but I arrived in time to hear Ken play perfectly to the audience and give a cracking speech. The GLA election campaign starts tomorrow. The Chair of Tower Hamlets UNISON Local Government branch, Rita Ash, died on March 3 after a long struggle against cancer. Her funeral begins at St Pauls, Bow Common, corner Burdett Road and St Paul's Way, E3 4AR at 2pm on Wednesday 21 March then 3.30pm in the City of London Cemetery and Crematoria in Aldersbrook, E12. Rita and I use to work together as UNISON assistant branch secretaries at Tower Hamlets Council. She was a school head cook and represented manual workers while I represented APT&C grades. Despite this largely artificial division, we worked together really well. Rita was by nature cheerful, kind and supportive. She was a rock you could go to discuss all sort of problems and difficulties. She was very special in many ways, not least because of her natural decency but also her absolute honesty. She had what we would say in Wales "no side", she was straight as a die and what you saw, is what you got. I took this picture of Rita after the 2007 special UNISON conference on pensions in Ally Pally (Alexander Palace). While my thoughts are with her family who she adored and will be devastated. I think there are so many people that Rita has helped and protected over the years who will also miss her. Her family has asked for donations to St Jospeh's Hospice. Check out this Justgiving site. Picture from yesterday's canvass session in Abbey Road, West Ham, E15. I represent the ward as a Councillor. After my surgery we met up outside the Rokeby Community Centre. It was pouring with rain at the beginning so we had split up into 4 separate canvass teams to call at the tower blocks and flats in the area and keep undercover as best you can. Since this is PR election every single vote in London will count. We need to bring out our core vote in East London to defeat Tory Mayor Boris Johnson. West Ham ward is solid Labour but the hostility shown by residents to the Tories is striking. There was several other Labour Party canvass teams out this weekend in Newham. Later that day our local City and London Assembly member John Biggs was in Forest Gate North. West Ham MP Lyn Brown is 4th from right and GLA London wide Assembly candidate Unmesh Desai is 3rd from left. After this I went over to the West Ham and Stratford Spring Festival (post to follow). fiduciary duties" by Fair Pensions. The speakers included "Professor John Kay, who is currently leading a review which looks into long-termism in the UK equities market; Saker Nusseibah, Acting CEO of Hermes; Roger Urwin, Global Head of Investment Content at Towers Watson and Baroness Jeannie Drake". Fair Pensions CEO, Catherine Howarth, chaired the meeting and its author, Christine Berry presented the report. 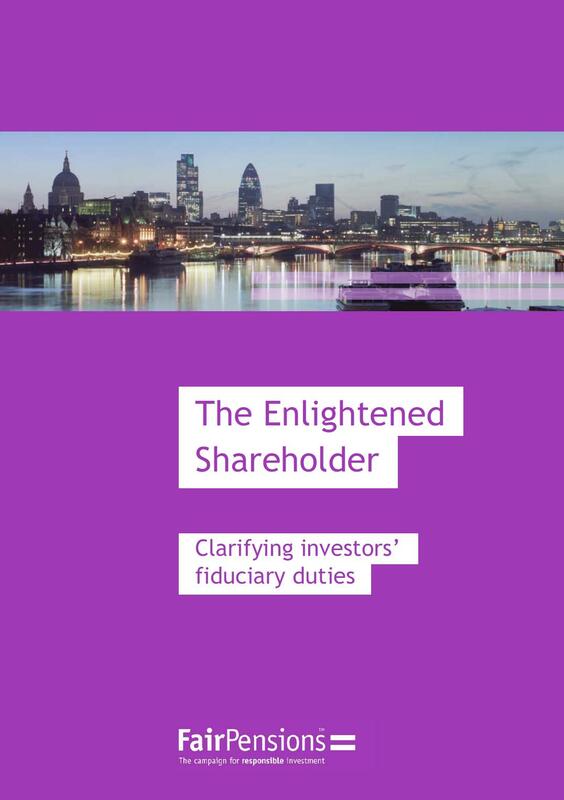 The big issue is whether or not the "fiduciary duty" of shareholder representatives (and trustees) ought to be legally redefined to deal with "crony capitalism and excessive executive pay". Pension trustees (and member nominated representatives) still come across advisers who tell them (completely wrongly I think) that their only role is to "maximise returns" of the scheme regardless of the impact it has on stakeholders, the wider economy and even the long term interests of the scheme. Which is clearly stupid and frankly bonkers. But it happens and it needs to be dealt with. I think this problem is widely recognised but there is the usual dispute about the solution. Should this be by statutory regulation or some sort of a voluntary code? As pointed out in the debate we have tried the voluntary approach for a long, long time. It has clearly failed due to agent self interests and conflicts. We need to regulate. Picture is from last night's Rally for Libel Reform which took place at the Great Hall in the historic Inner Temple. There was a number of speakers including Lord McNally, who is the Lib Dem Minister for Justice ,who said about the (probable) Libel Reform bill "This is not the end, not the beginning of the end but the end of the beginning". Sir Stephen Sedley "The draft bill hasn't answered all the questions but has some of the answers", Simon Singh (a libel survivor see in picture with the fetching Mohican haircut), Nick Cohen (Observer) "not one of the stories in the NOTW and Sun enquiry has a public interest defence. Not a single one", DAG (New Statesman and free speech libel hero aka Jof k), Charmian Gooch (Global Witness), Tracey Brown (Sense About Science), Jonathan Heawood (English PEN) and Jo Glanville (Index on Censorship). While picture on the right is of DAG, me, Vaughan Jones and top solicitor advocate Robert Dougans. Vaughan is currently being sued by a Creationist for libel in the High Court. There is a strike out hearing next Friday. I am convinced that the litigant in person who is trying to sue him must be related in some way to my own favourite litigant ever! The Homeless Charity and the "Race to the Gutter"
Below is the UNISON press release on the attack on terms and conditions of staff employed by London Homeless Charity Broadway. Our members (seen lobbying their Board meeting on Tuesday evening in Commercial Street, Tower Hamlets) carry out a very difficult and demanding job supporting vulnerable single homeless people across London. both "on the street" and in hostels and projects. Of course the original "villain" in all this is the Tory Government for cutting "Supporting People" funding. However, a small number of rogue Housing Associations and "Charities" are under cutting decent employers in a bidding war to win "new business". This is truly a "race to the gutter". You simply cannot provide a quality service to clients by decimating your staff's pay and conditions. No responsible employer should take part in such bids. Our branch is launching a campaign against "Rachman employers". Believe it or not there are employers who are treating staff even worse. On the 13th March angry UNISON members employed by Broadway Housing Association lobbied Board members, following their decision to slash wages and dramatically cut terms and conditions. · Reduce the pay of new front line staff by at least £4,500 per annum – in effect a 20% reduction in salary (with salaries which currently stand at between £23,000-25,000 being pushed down to between £18,500 – 20,000). 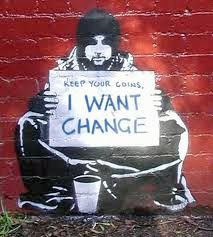 · Reduce the pay of 14 existing staff which Broadway believes are paid above the medium wage for their roles. · No pension provision (current staff receive 5% employer contributions matched by 3% employee contribution). · Reducing Annual leave entitlement to statutory requirements (a loss of 6 days per year). · Reducing sick leave entitlement (to statutory during probationary period and a 4 weeks full pay and four weeks half pay per annum in the first three years of employment). · Reducing maternity pay to statutory. In addition to these cuts Broadway intend not to pay a cost of living increase for 2012/2013. “ It is absolutely shameful that Broadway have apparently made a strategic decision to position themselves away from a focus on quality; which the organisation have in past been associated with, and move themselves towards the “no frills airline” model of care and support. The organisation are clearly re-jigging themselves to be at the forefront of the race to the bottom which we are witnessing in the sector. It is really sad that very skilled people who work in some incredibly challenging environments are being so un-fairly rewarded for the jobs they do. Broadway claim the cuts are necessary for the organisation to remain viable and continue to be in a position to win new services claiming it could not allow its reserves to fall below £850,000. Great new videos from Housing Charity "Shelter" launching their "Homes for London" Campaign. Shelter want the London Mayor candidates to commit to setting up a "Homes for London" agency if they are elected. Similar to "Transport for London". There was a number of defensive rings built around London against an expected German invasion. I once went on a West Ham Labour Party historical tour of the area led by a local historian who explained about the defences and that the final defensive ring in London was around Whitehall. The Prime Minister, Winston Churchill was reputed to have vowed never to leave in the event of an successful invasion and to have pledged to remain and defend London to the death. You could imagine his final counter attack against the advancing enemy while smoking his trademark cigar, with a glass of single malt whiskey in one hand and a Tommy gun in the other. 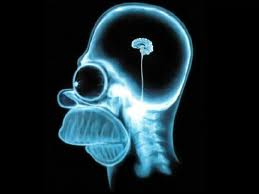 It's a no brainer actually (apologies to Homer Simpson whose scan in on right does show he has a brain although it is very small and rarely used e.g tax payers alliance supporter). There are millions and millions of workers in the UK who have access to a pension provided by their employer but they have not joined the scheme. Sometimes it is because the scheme is pretty rubbish and that there are no real incentives given by the employer to encourage their staff to join. Yet often this is not the case and workers are losing vast amounts of money each year by not joining. The 25% apparently eligible to join the Local Government Pension Scheme (LGPS) who haven't are losing at least 14% of their wages each year. They also even pay more income tax and national insurance. However, the real people at risk from not joining their scheme NOW are in defined contribution (aka Group stakeholder or personal pensions) company schemes whose employers pay reasonable contributions if the members also pay something into it. Many of scheme are pretty good. Not as good as say the LGPS but nothing to turn your nose up upon. Decent employers know that any decent pension will cost a lot of money and they have to play their part in providing funding. The risk ironically to these "decent" schemes is the introduction of pension autro enrolement next year. Enrolement is a "good" thing and will mean that nearly all workers in the UK for the first time will be automatically put into a pension scheme. What is worrying some employers is that this may mean that the total bill for pensions will rise. If auto enrolling works (and there is some doubt) then instead of 25% of the workforce being in the company pension scheme this may rise to say 50% or more. Potentially doubling the pension payroll. What many people fear is that some companies (including ones that use to provide non contributory final salary schemes free to all their employees in a more enlightened age) are planning to either slash and burn existing contribution rates or introduce 2nd tier pensions for employees who have not joined the existing scheme. We need to oppose all attempts to reduce contributions. The more in the scheme the more difficult it will be to cut it. This is a call to arms to all union reps to "encourage" (we cannot give specific individual financial advice) our members to consider joining their scheme. If they don't, it may not be around much longer. Use it or lose it. "What do you think Prime Minister?" Hat tip "anon". This song and the music takes me back to when as a teenager I lived in Holywell, North Wales, which overlooked Liverpool across the Dee Estuary and the Wirrel. During the Toxteth Riots of 1981 we could see parts of Liverpool burning from Holywell due to the disturbances. It was a sobering experience which I have never forgotten and which I remembered during the riots in London last year. To be clear - there is no excuse for such violence behaviour. Yes, we had Tories doing what Tories always try to do the poor in 1981 and 2011 but burning and looting your own community is just plain stupid. It is always the ordinary working class people who always suffer the most from such riots. Yet, anyone who does not think mass unemployment and extreme poverty will not result in such violence, sadly just doesn't get it. A Solar Future for Social Housing? "Decent Homes work was evidently coming to an end late in 2010. No other investment for improving Council housing had been mentioned by the Tory-led government. An acquaintance with the author-publisher of this blog had taught the UNISON stewards in Ascham Homes that Housing Associations had already been making development staff redundant. Could we influence our ALMO to do anything that might keep our colleagues in a job and show that the public sector could still do new, useful things in these dire times? We were aware that some ALMOs and Housing Associations had done “rent a roof” deals with private sector partners to offer free solar electricity to their tenants. We were also aware of the contracts drafted by the London Development Agency for Ken Livingstone in 2007/8 for private sector partners to lead investment in energy efficiency and be paid from the future savings. UNISON stewards in Ascham Homes wrote “Every South facing roof is a potential Power Station” in January 2011. Waltham Forest Council got HM Treasury approval for Prudential Borrowing of £9 million to fit Solar Photo-Electric Panels to 1,000 Council houses and some of its big buildings. This way the income of up to £2 million is to the Council. 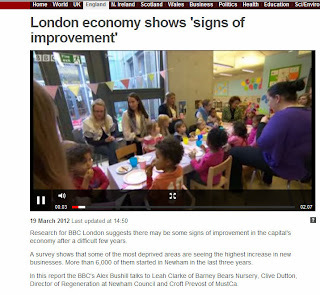 The project was reported on the “Waltham Forest Guardian” website on Thursday 3rd November 2011. The government announced the Tariff cut the next week and the scheme was put on hold. During the new round of number crunching, several colleagues became redundant. It was still viable! Two Contracts were let, each for 500 houses to be completed, by 31 March 2012 and as many as possible before the Tariff cut. Letters went to tenants late in January 2012 outlining the scheme. 688 were done by Friday 2nd March 2012, when the Tariff cut began. Energy efficiency is Investing to Save. Costs are coming down, but future projects will become more complex and demand more skill. UNISON needs to shout more about being the Construction Professionals Union. This motion was passed (overwhelmingly) at last week's London UNISON Labour Link Forum. It will now go to National Forum. We note this Tory Coalition Government and its policies tn favour of the wealthy, its plans to dismantle our NHS and the slashing and burning public services. 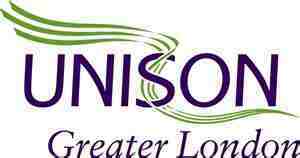 Guest Post by Anjona Roy from UNISON Northampshire Country branch. "For the past six years I have worked for Northamptonshire Rights and Equality Council, a small local charity that provides advice and representation to victims of discrimination. In the last few months, I like many others in local community and voluntary organisations have been trying to bring in as much funding as possible in order that our services still exist after this month for the coming financial year. With young people, families and pensioners facing a tougher and tougher future in Con-Dem Britain, the need to easily accessible, accurate and timely advice is greater than ever. The bed rock of community based advice provision has always been the citizens advice movement. Often the advice consists of signposting and it is relatively infrequent that the advice involves ongoing casework. These organisations are supported with a national infrastructure and the majority of work that they pick up tends to be fixing errors and screw ups by social housing, the benefits agency and benefits sections of local government. The mainstream community and voluntary advice sector thus spends significant proportions of its resources in helping public services deliver to some of the most vulnerable people in our communities. It’s a really good argument for the need of government and local authorities to invest in advice. However, the argument doesn’t translate when you start discussing discrimination advice. Despite the fact that our organisation has been delivering discrimination advice for the past thirty years, discussions with local authorities in our area clearly indicate that supporting individuals when they experience discrimination, isn’t what they want to invest in. They would rather things not get that far. They would rather that local businesses, local services did not discriminate and then no formal action, no challenge, would ever have to be endured. This all comes from a view of the world that people don’t generally act unfairly or want to act in a way that is unfair and that most of the time when discrimination happens it is due to misunderstanding and the services and employers just need that little bit of extra assistance to ensure that their equality practice is positive and legally compliant. A view echoed by the Government Equalities Office review of the Equality and Human Rights Commission last year. Tell that to victims of discrimination and see what the response is. Tell that to the catering manager who was told by her supervisor “If you were my dog I would have you put down”, who was told that she was made redundant and then later saw her own job being advertised on the company website. Tell that to the Eastern European baker who’s manager told her that he “only employed Polish idiots”. Eliminat[ion of] unlawful discrimination, harassment and victimisation and other conduct prohibited by the Act. Advance[ment] equality of opportunity between people who share a protected characteristic and those who do not. Foster[ing] good relations between people who share a protected characteristic and those who do not. If this was so easy, then why require the general duty under the Equality act 2011. There’s also a requirement to “publish information demonstrating compliance with the general duty under the equality act” by 31st January 2012. From a quick scan of the public bodies operating where I live only 20% have complied with this requirement and even those that have reported, haven’t all reported on both workforce and the delivery of services. So much for the positive hearts and minds of those responsible for the delivery of public bodies and their commitment to comply with legal requirements. The truth is that when it comes to equality, the growth in capacity has been the in the knowledge of how to discriminate and not leave tracks to enable action to be taken by a complainant. In the current economic climate there has been an exponential growth in employers offering contracts with working hours being detailed as 0-37 hours per week. With this kind of a contract unless there is an out and out admission that discrimination is taking place employers are quite within their rights to no longer offer work to the woman who has just found out that she is pregnant or the disabled worker who’s role had changed and requires an additional reasonable adjustment. The truth is that discrimination is about whether one group of people matter more than another and how many of us are willing to stand up and be counted when the chips are down. If you are one of those who want to stand up and be counted please sign the petition on this link. 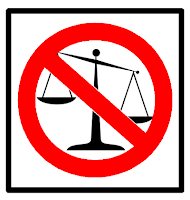 and join the Justice for All campaign to protect free local legal advice. On the left is John Biggs the local Labour City and East GLA candidate, and to the right of Sadiq is East Ham MP Stephen Timms and West Ham MP Lyn Brown MP. Double click to bring up detail. The event had been organised by Newham Cllr Unmesh Desai, who is also standing as a GLA candidate in this year's election. The buffet meal was absolutely excellent. I shared a taxi home with some of the Newham born Leyton and Wansted CLP crew who shame us by always turning up and supporting our events. This post is a little late but the training run of Week 20 was along Brighton Sea front last Sunday morning before the UNISON Community conference. It was only a 30 minute run towards Hove and back but you cannot beat running alongside the sea side when it is cold, damp and windy. Especially if you are trying to get rid of a sore head from the night before. But what was not at all good was the number of homeless men I ran past sleeping rough in Promenade shelters and shop doorways. Some of them looked very, very young. I've slept outdoors in winter when I was younger but that was usually wearing waterproof clothing in proper tents with warm sleeping bags and gas cookers. The relatively large number (I think 5) of homeless men (didn't see any women) sleeping rough along the beach looked tired, cold, wet, dishevelled and frankly miserable. I was conscious that I was at a housing related conference, staying in a nice hotel, looking foreword to a hot shower, clean clothes and cooked breakfast after my completely self indulgent run. While I hope the political motion at the conference about greater income equality may do some good in the long term in the meanwhile I am glad that I will be running the London Marathon for a charity set up to prevent young people becoming homeless and helping them if they do. Check out "Alone in London". Click here to sponsor me on the Justgiving website. Below are the tweets (and retweets) I made at last nights "Save Our NHS" rally at Westminster. It was a really impressive display of the wide breath of opposition to the proposed reforms. The first tweets start on the bottom. Last but not least Andy Burnham MP labour Shadow Sec of State for Health. "No longer one NHS"
Dr Alex Scott-Samuel, public health physician: The NHS is in danger of becoming nothing but "a logo, a budget & a few quangos"
Another public health professional against the bill. Dr Alex Scott-Samuel. "There will be more deaths under this new system". So, why are people yelling at an MP who has voted the right way every time? Dorothy Matebeni President SA nurses union DENOSA Viva NHS Viva!!!! Don't let r NHS slide into a USA model. Video of US health worker talking of their privatised health service. Steel worker union? Mary Locke houskeeper in a hospital has adopted over 350 peers to drop the bill. "We don't want spaghetti junction nhs"
Top unison hospital house keeper Mary Locke tells it as it is! Rehana Azam GMB National officer and head of NHS "if we had the Royal College of Surgeons we would have a full house"
Dr Peter Carter GS RCN NHS reform "we will have people competing with each other rather than cooperating with other"
Jo Brand - "I do have a soft spot for Nick Clegg, it's face down in a bowl of custard"
Jo Brand NHS could mean "Not here soon"
More selfish wreckers and splitters leave with via a helping hand. One dressed as a cat? Was it george galloway? Patient Vikki Mills pregnant with twins does not want anyone to jump que if they have money. Cathy warwick GS RCM "kill the bill"
"Its about what health service we leave our children...our NHS is not for sale"
At packed Save our NHS rally at Westminster Central Hall. Brendan Barber speaking.